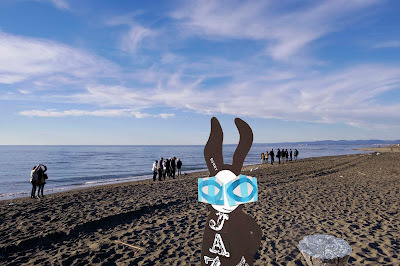 The Wabbit found himself blinking at the exit from the beach. The winter sun beamed down from an azure sky. "Wabbit!" shouted Lapinette, "Where were you?" Skratch meowed from behind the fence. "You were supposed to meet us at the caffè." The Wabbit blinked again. "I was under the beach, you were both there." Lapinette looked at Skratch and Skratch looked back. Skratch and Lapinette shook their heads. "You were!" said the Wabbit. He waved a paw at Skratch. "You were running the Underneath the Beach Bar." "Well, I hope I got paid," shrugged Skratch. He meowed a disbelieving meaow. The Wabbit pointed at Lapinette. "You came down the ceremonial staircase." "Where?" sighed Lapinette. "Under the beach," said the Wabbit, "you danced down and you got an award." His voice trailed off to a whisper. "There was an Escher staircase and that's how we got back here." "I came in the Jeep," said Lapinette. "Perhaps you were in the sun too long," suggested Skratch. 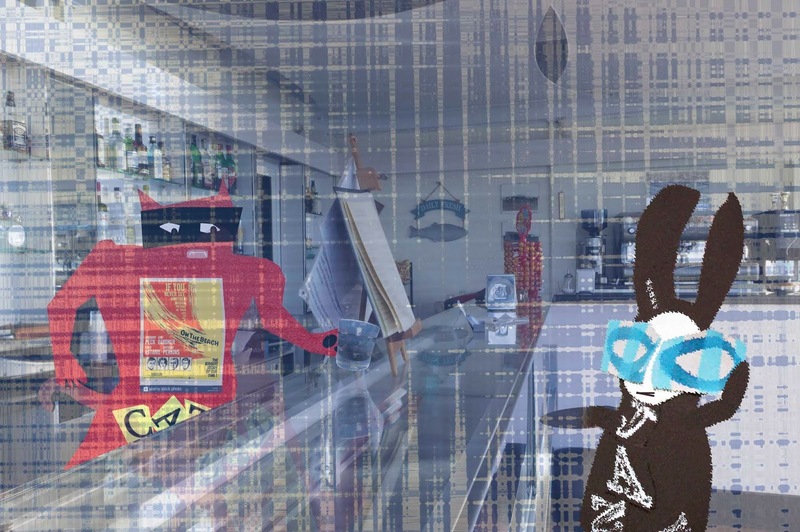 "Maybe you lingered longly in the caffè," smiled Lapinette. The Wabbit thought for a minute. "No, no. A crowd of people came on the beach and pointed everywhere and then a piece of driftwood turned to ice." Skratch nodded in agreement. "That would have been the ice men." He winked at Lapinette. 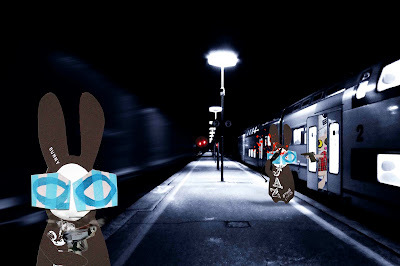 Lapinette winked back, but the Wabbit saw it and he shrugged and grinned. "Do they cometh often?" "This way," shouted Lapinette and she scampered up the stairs. 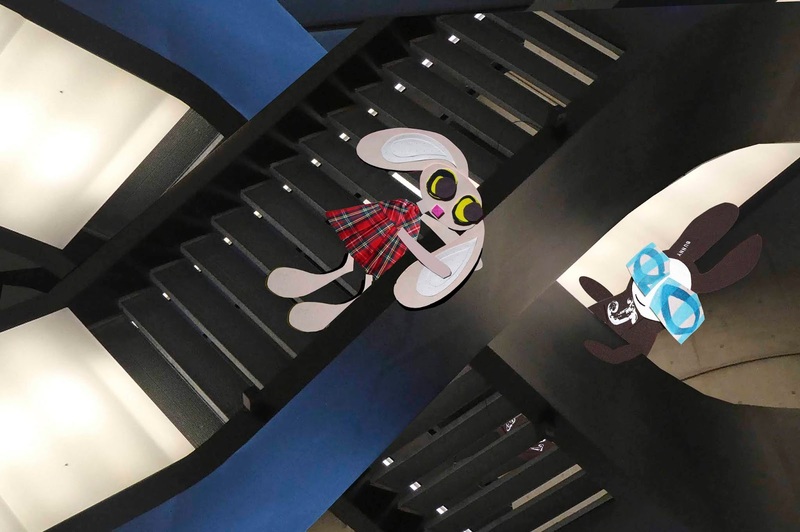 The Wabbit tried to follow, and he scampered up too - but he found himself on a different set of stairs. The two stairways weaved in and out. No matter what he did, he couldn't find the other stairs. He thought he would jump but things changed quickly to thwart his efforts. Lapinette looked over the banister. "Come on Wabbit, this way to the beach." 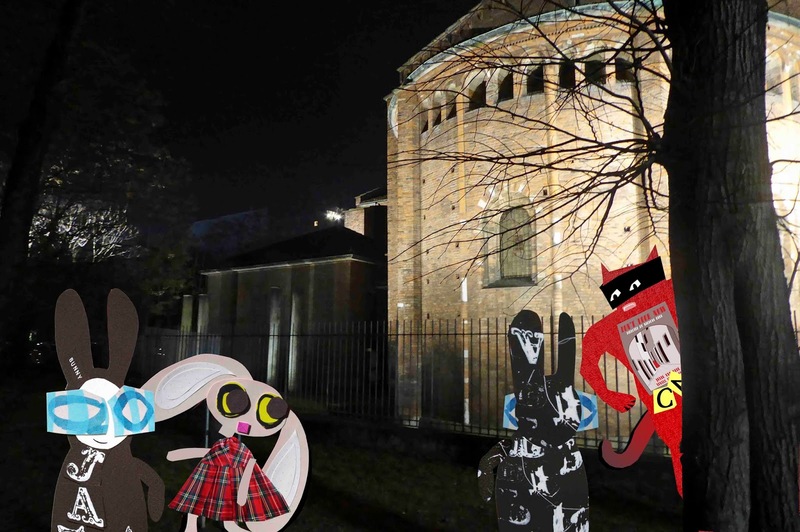 The Wabbit grinned in spite of himself and he called to Lapinette. "Who designed this stairway? Was it Escher?" Lapinette danced merrily on because both sets of stairs were ascending rapidly and the steps started to fold like an express escalator. 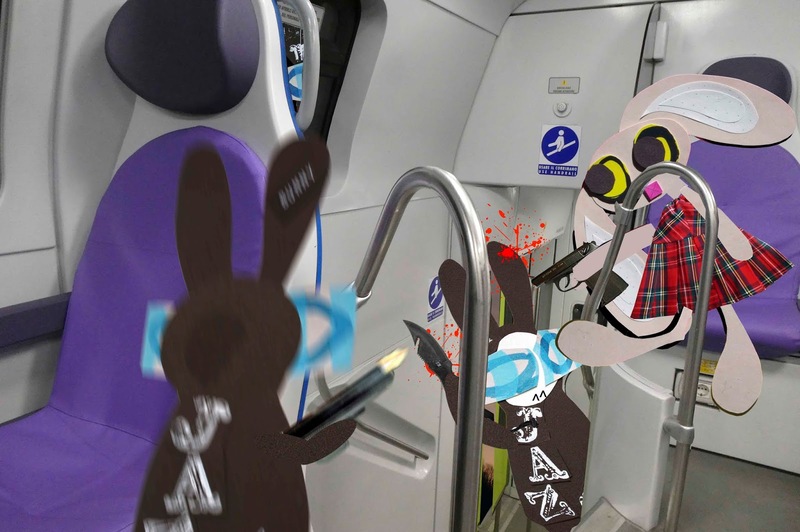 The Wabbit hopped up and down as treads snatched at his fur. His stairway took him higher than Lapinette and he seemed to look down from a dizzying height - but then it dropped with astonishing speed. He leaned out to touch Lapinette's paw on the way past, but now the staircase turned upside down. Lapinette looked down at him from a startling height. She shouted. "You just have to think your way up. Think high, think tall." So the Wabbit thought tall, thought high. Both stairs lifted. Escalator steps shuffled like packs of cards and propelled the Wabbit and Lapinette higher and higher. He could smell sea and salty air - and fish. 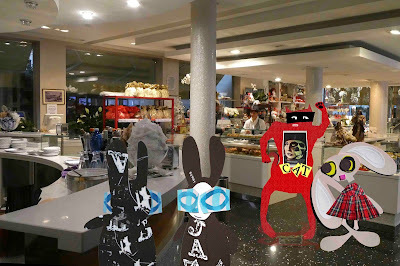 "I'm thinking of lunch," said the Wabbit. The Wabbit tried again. As he traced his way along the corridor it gave way to a staircase that shimmered in a blue light. The steps appeared to dance. The banisters shook to the rhythm of a Bossa Nova. The Wabbit felt his paws tap to the music, he just couldn't help it. He leaned against the wall but the wall shook too. Everything moved. He heard a voice. "Wabbit!" Down the stairs danced Lapinette with her paws outstretched. He stretched out his own to greet her. "Lapinette, what is this place?" "This is the ceremonial under the beach staircase," sang Lapinette. She pirouetted twice and sailed into the Wabbits paws. 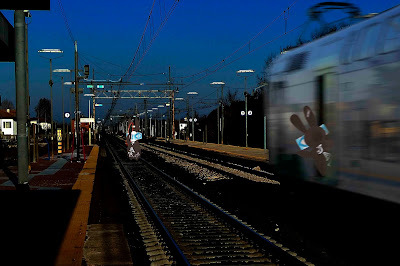 The Wabbit hugged her and grinned. "Ceremony? What ceremony?" Lapinette continued to gyrate. "The Under the Beach Awards." 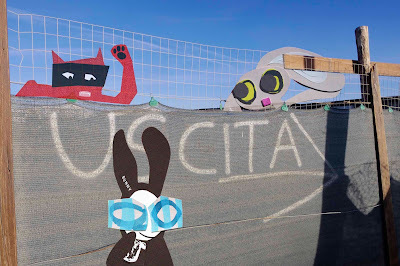 "Oh," said the Wabbit, "who won?" "I won," laughed Lapinette, "I always win." The Wabbit shrugged. "Did I win anything?" "Everyone wins something," laughed Lapinette. She continued to dance. 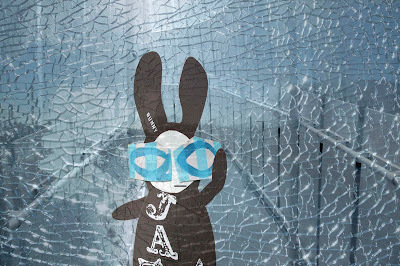 The Wabbit raised an eye. Lapinette paused. "Best original screenplay set on a beach award." 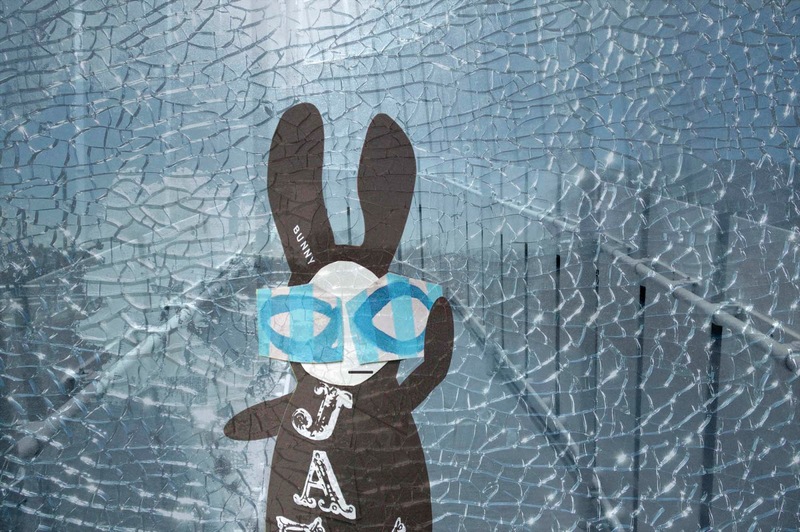 The Wabbit's eyes lit up and he gave a little bow. "Then I'd like to thank Lapinette for dancing down the ceremonial staircase." "Why don't we dance up it," suggested Lapinette. "Where does it go?" asked the Wabbit. Lapinette laughed. "To the top of course."